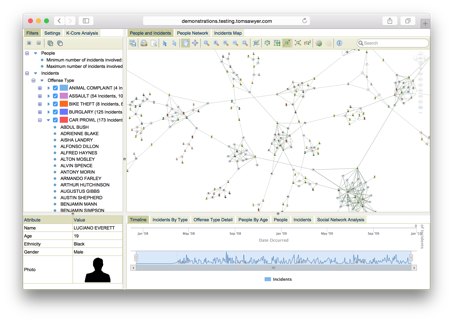 This data visualization application is created with Tom Sawyer Perspectives and displays information pulled from data stored in a Neo4j graph database. 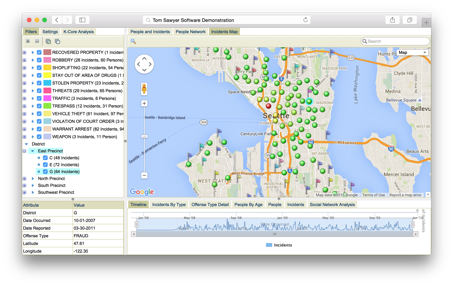 The application displays crime incidents within the city of Seattle, Washington between 2007 and 2009, attained from a subset of data collected from the Seattle Police Department Police Incident Reports. For demonstration purposes, the data has been altered so that the suspects and their associations utilize a fabricated list of individuals to create a hypothetical criminal network. The people nodes denote the different individuals involved in crimes. Clicking on a specific person node will give you details about them within the Inspector View, such as their name, age, ethnicity and gender. Offense nodes display offense types, such as burglary, narcotics arrest or fraud. Edges represent the links between these individuals and incidents. This drawing utilizes symmetric layout – one of several layout styles available with Tom Sawyer Perspectives. Based on the information you are trying to display, you may find that other layout styles provide you with different perspectives of this interconnected data. These layout styles include circular, hierarchical and orthogonal. In addition, there are graph analysis algorithms that you can utilize in this application to help you understand these networks in more detail. Each offense node is also linked to a specific time of occurrence in the Timeline View, so users can visualize data from a specified time range. In addition, there is an Incidents Geographic Map view to display specific locations of offenses on a map, marked by flags and pins. Certain offenses are grouped hierarchically to reduce clutter. Zooming in on the map expands these clustered pins to reveal individual incidents. How was Tom Sawyer Perspectives built? Tom Sawyer Perspectives is advanced graphics-based software for building data visualization and analysis applications. The data was loaded with the Tom Sawyer Perspectives’ Neo4j Cypher query data integrator. Tom Sawyer Perspectives also supports federated data integration with update and commit facilities. In addition to Neo4j, these data integrators include REST, JSON, XML, Text, SQL, Excel and RDF. 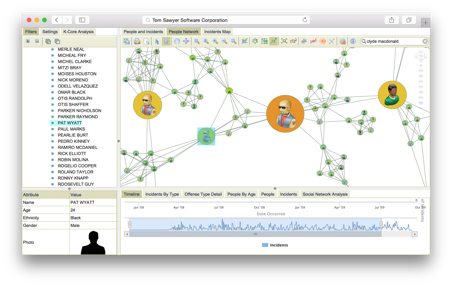 Using these integrators, you can bind a visualization and analysis application to data through a graphical development environment, called the Tom Sawyer Perspectives Designer, to build visualization and analysis applications. What can it do? What’s special about it? 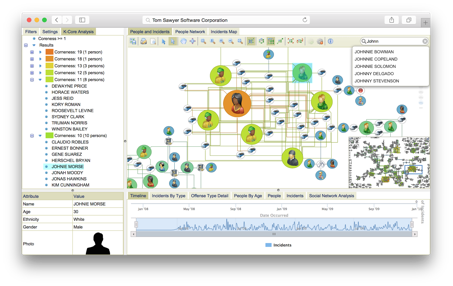 The beauty of Tom Sawyer Perspectives is that it can display your data with up to seven view types. This gives users a comprehensive view of their data and allows them to explore their data in a variety of ways. With the latest addition of Timeline View seen at the bottom of the application, users can now solve problems simultaneously spanning relationships, locations and time. This application can assist users in identifying top criminal offenders and identify the locations and times that certain crimes are more likely to occur. With this critical information, law enforcement agencies can better prepare themselves to protect the public from crimes. Tom Sawyer Perspectives also arms users with over thirty powerful graph analysis algorithms to interpret their data and pinpoint the most relevant information. There are also a few analysis algorithms that are built into this application, including k-core analysis. 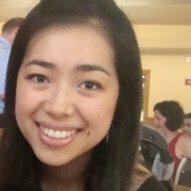 This analysis allows users to assign a coreness value to each person. People with a high coreness are identified, which denotes that they share a high number of links with other individuals who also share a high number of links within the same groups. In Figure 4 below, the orange node indicates the person with the highest coreness value, while smaller blue nodes indicate people with the lowest coreness values. In addition, users can find the intermediaries or middlemen in their data based on specified criteria by running other social network analysis algorithms. With this analysis, each individual is ranked, from those who intermediate the most to those who intermediate the least. Click here to try a demonstration of Tom Sawyer Perspectives or stop by the Tom Sawyer booth at GraphConnect San Francisco tomorrow to see an in-depth demo with this application and dataset.